EARLY BIRD MALKIN BOWL 2-DAY PASS on sale, Friday, Feb 26 at 10am PST! Levitation Vancouver’s programming maintains the spirit of LEVITATION in Austin, TX, offering a wide range of international and local talent across the musical spectrum, with an emphasis on artists with an experimental and/or psychedelic edge. 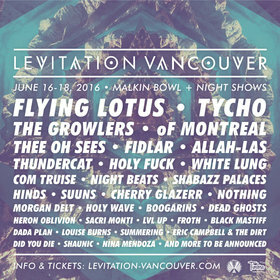 Levitation Vancouver works closely with community partners to provide a safe, accessible and environmentally conscious experience for all festival-goers while championing local and independent Vancouver businesses and artists. Food trucks (Tacofino, The Juice Truck, The Local Omnivore & more) will be on site at Malkin Bowl in beautiful Stanley Park. Plus beer gardens, water stations, bike valet, merch area and more surprises to be announced.